4KR1100AAUW: 4.8 volt 1100mAh rechargeable Ni-Cd receiver battery. Made with 4 x AA-size cells. Same physical size as common stock Receiver battery, but provides LONGER LIFE. Flat pack dimensions: 2.25" across x 2" tall x 0.56" thick. Square pack dimensions: 2" tall x 1.125" x 1.125". Choose Pack Shape, and choose wire leads or Connector from scroll-down menus. Replaces battery pack model #s such as NR4J, NR-4J, NR-4M, NR4M, NR4QB, NR-4QB, 54117, 95004Z, 95098Z, 95008Z, JRPB3140, 95009Z, 95003Z, many more. These battery packs are made in the U.S.A. by BATTERIES AMERICA. Weight of this 4.8 volt battery pack: approx. 4 ounces (112gms). $16.95 base price is for flat battery pack with wire leads. 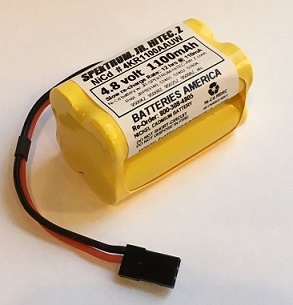 Connector (Futaba J, or SPEkTRUM-JR-HiTEC-Z, or original AIRTRONICS) is installed for $2 extra. Recommended chargers: FBC-19B(4), Ni-Charger, CG-25A, NEC-221, YT-0006S, UP100AC, HiTEC X4AC Pro. Futaba Female to Tamiya Female adaptive connector. Futaba-style Female connector at one end (plug your Futaba battery into it); Enables fast-smart charging of the battery pack. 4N700AACW : 4.8 volt 700mAh rechargeable AA Ni-Cd receiver battery NR4J NR4M . Choose shape, wire leads, and Connector. 4N700AACW: 4.8 volt 700mAh NiCd receiver battery packs, made with standard AA-size cells. Choose pack shape, connector type, or just with wire leads. 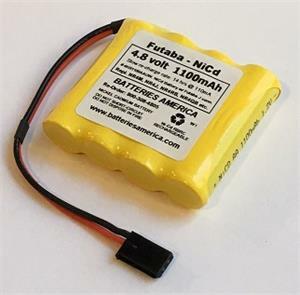 Replaces standard Futaba, JR, HiTEC, SPEkTRUM, and AIRTRONICS receiver batteries. CG-25A : HiTEC-brand wall charger for 4.8volt & 9.6volt battery packs. CG-25A: HiTEC-brand wall charger for 4.8 volt Rx & 9.6 volt Tx battery packs. RX charging plug goes into battery pack or switch harness; TX charge plug goes into back of Radio Transmitter. Charges @ 55mA/hour. NT8LP : 9.6 volt Transmitter Packs - Tip Clip style (9-volt snap contacts on end). Choose from Ni-Cd & Ni-MH Capacities (700mAh thru 2700mAh). Pricing starts at $28.00 for base 700mAh capacity. 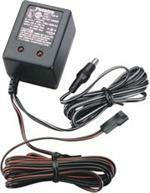 FBC-19B(4): Futaba-brand Wall Charger for 4.8v & 9.6v packs. Plugs into 110-120VAC. Charges 4.8v packs @ 100mA; charges 9.6v packs @ 70mA. 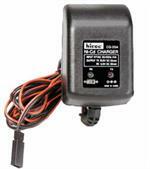 Ni-Charger: Smart Charger for 4.8v RC battery packs, and for AA, AAA cells. Charges 4.8v packs @ 375mA per hour, with automatic smart shut-off & trickle charger. Also charges up to 4xAAA or 4xAAA NiCd & NiMH battery cells. AC & DC operation.